Latest predictions indicate that China’s defunct Tiangong-1 space laboratory will fall to Earth most likely on April 1. According to updated calculations made by The Aerospace Corporation, a non-profit corporation providing technical guidance and advice on all aspects of space missions, the school bus-size station will enter the atmosphere around 11:15 a.m. EDT (15:15 GMT) plus or minus 14 hours. The European Space Agency (ESA) has also updated its forecast regarding Tiangong-1’s descent. ESA’s Space Debris Office, which coordinates the agency’s research relating to space debris, now predicts that the spacecraft will fall to the planet between the night of March 31 and late evening of April 1. The office said these estimates are always subject to change due to an array of variables, including variations of the atmosphere due to solar activity. Meanwhile, the U.S. Joint Space Operations Center (JSpOC) has issued its own prediction for Tiangong-1’s re-entry. JSpOC estimates that the space laboratory will fall to Earth most likely at 8:52 p.m. EDT March 31 (00:52 GMT April 1) with an uncertainty of plus or minus 15 hours. According to China Manned Space Engineering Office, the 18,740-pound (8,500-kilogram) Tiangong-1 will burn up almost entirely in the atmosphere and it is highly unlikely that any surviving pieces would cause any damage on the ground. Furthermore, in a note that China sent to the United Nations on March 26, Beijing claims that the probability of damage to aviation activities and human life and facilities on Earth is extremely low. Tiangong-1 is expected to reenter somewhere between 43 degrees north and 43 degrees south latitudes. This large swath of Earth includes northern parts of the U.S., as well as countries such as Spain, Italy, Turkey, China, North Korea or Japan in the Northern Hemisphere. When it comes to the Southern Hemisphere, the likely locations that might be affected would be Chile, Argentina, Southern Australia or New Zealand. 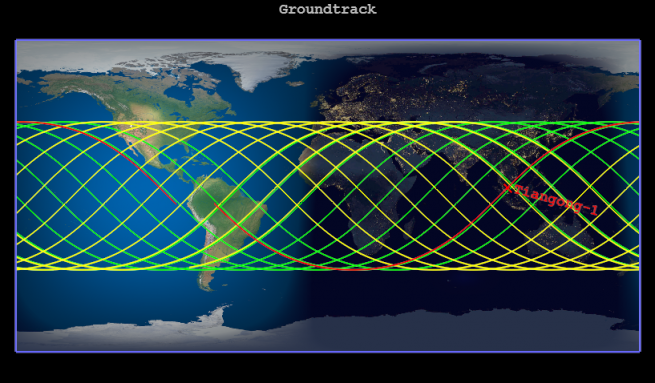 However, with its reentry window narrowing, the ground track across the planet is also narrowing. Much of the land area of the planet can already been ruled out. Even so, because most of Earth is water, the station will most likely burn up over water. Tiangong-1, which means “Heavenly Palace,” was China’s first space laboratory. The single-module station measures some 34 feet (10.4 meters) long and has a diameter of approximately 11 feet (3.4 meters). The spacecraft was launched in September of 2011. Control over Tiangong-1 was lost on March 16, 2016. It is assumed that the space station ceased functioning due to a dysfunctional battery charger.